That acid is sulfuric acid. According to the Environmental Protection Agency… that acid can cause heavy metals to leach from rocks. The resulting fluid can be highly toxic to people and wildlife. Matt Johnson is with Kennecott. He says the company will use a state of the art water treatment plant to purify the mine water using reverse osmosis. And he says the state is also requiring them to do that. 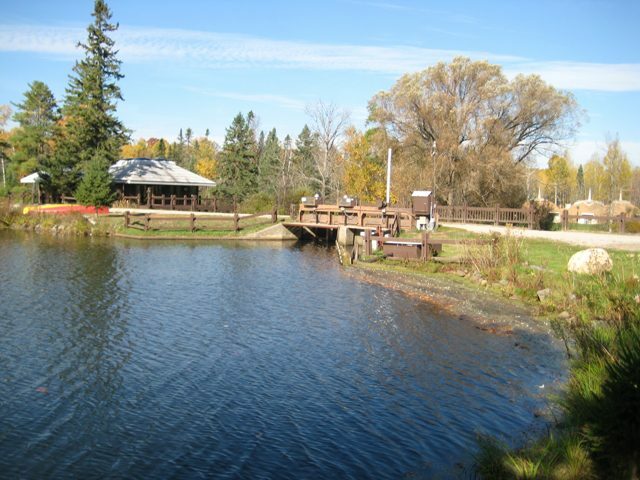 But critics are still concerned about the nearby Salmon Trout River and Lake Superior. Michelle Halley says the treated water from the mine will eventually be discharged to groundwater. Those unknowns about possible water pollution have divided the surrounding communities. Daryl Wilcox is the Powell Township Supervisor. The company’s estimating there will be about 240 mining jobs available. They say the jobs will last seven or eight years. Wilcox says he knows a lot of people who are planning to apply for those jobs. Wilcox says the mining company took him on a tour of their new water treatment plant. And he says he’ll give them the benefit of the doubt. The company is expecting to start pulling minerals out of the ground in 2013. Many people have been watching what happens with the Kennecott Eagle Mine. It’s one of several companies hoping to tap into potentially billions of dollars worth of nickel, copper, gold, and platinum – in the Upper Peninsula. Owners at Golden Lotus yoga retreat have twice made big mistakes operating their dam over the last quarter century. And each time, muck from the pond behind the dam surged downstream. It smothered river life, and killed tens of thousands of trout. Dave Smethurst has been fishing, hunting and hiking in the Pigeon River State Forest for the last 40 years. And both times the dam failed, he was there to witness the destruction. 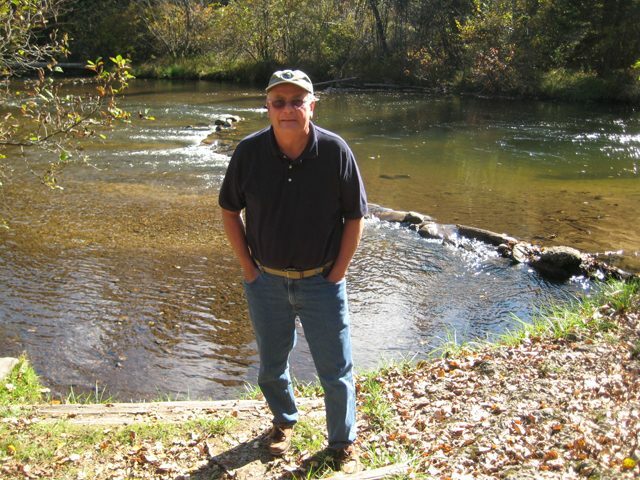 Smethurst is on the board of the Headwaters Chapter of Trout Unlimited. T.U. is party to a lawsuit by the state of Michigan against Golden Lotus. The organization has been pushing for the entire dam to come out. And when it’s gone, Smethurst expects to see a better river. For one thing, he says, the 50 acre pond behind the dam eventually will go away. 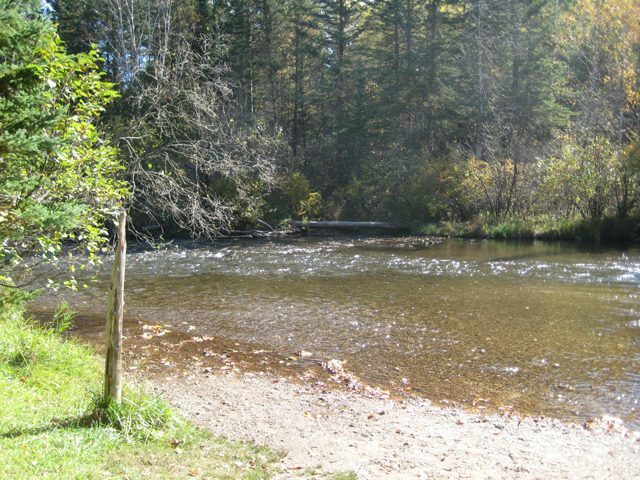 The shallow pond releases water too warm for trout to live in. Not only that, Smethurst says, but it acts as a choke point piling up sand and sediment for miles upstream. But fishing is not a high priority for the owners of the Golden Lotus yoga retreat. Carol Armour is chair of the board of the non-profit group. She says the retreat was founded several decades ago by a wealthy Detroit businessman. Armour says the dam and the pond have been here for more than a hundred years. And she says the setting has become a spiritual home for those who return to get in touch with the deeper aspects of yoga. Dave Smethurst with Trout Unlimited also feels the Pigeon River is the kind of place that restores the soul. But he says the Golden Lotus property doesn’t fit his idea of a natural place. Ordinarily the Department of Natural Resources would agree. It’s agency policy to completely remove dams whenever possible. But in an unusual twist, DNR officials sided with Golden Lotus to allow part of the structure to remain. The yoga group says it needs to keep concrete walls along the sides of the dam and a concrete pad on the bottom to support a small bridge across the top. That’s the main way to reach their office, lodging and classrooms. Tim Cwalinski is a DNR fisheries biologist. He says it’s a big win to get an agreement just to remove guts of the dam. With that gone, he says, the possibility of another failure and more fish kills disappears. 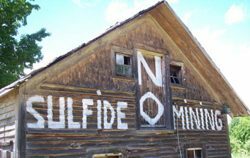 But members of Trout Unlimited don’t feel good about it. They say leaving concrete on the bottom of the river will speed up the flow of water so much that most fish will not be able pass upstream. State officials think mostly smaller fish will be blocked. The question of how much of Golden Lotus Dam will have to be removed is headed to the Michigan Court of Appeals. For the Environment Report, I’m Bob Allen. Michigan’s only oil refinery is in the middle of a $2 billion dollar expansion project. Marathon Petroleum is expanding its refinery in southwest Detroit to process more heavy crude oil from Canada. That expansion project is moving the footprint of Marathon’s refinery closer to people’s homes, especially the Oakwood Heights neighborhood in Southwest Detroit. A couple weeks ago, the company made a big announcement. Marathon is offering to buy about 350 homes in Oakwood Heights. The company is offering a minimum of $40,000 dollars plus half of what the home appraises for. There’s also money to help people relocate. Tracy Case is with Marathon. He says the company is planning to demolish the homes it buys and create about a hundred acres of green space next to its refinery. He says the program is voluntary and no one will be forced to move. For some people in this neighborhood, it’s the news they’ve been waiting for. 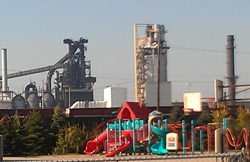 This part of southwest Detroit is packed with heavy industry. There’s the oil refinery, the salt mine, the steel plants, the wastewater treatment plant. Many residents were born and raised here. But many of them are tired of living here. Theresa Landrum has lived in this area all her life. She’s on Marathon’s community advisory panel. She says she’s happy with the news of the buyouts. But she’s not eligible for one because she lives outside of the designated neighborhood. Some people who are eligible for the buyout say it’s not enough money. Carrie Elliott says he’s too old for a new mortgage… and he doesn’t think he’d qualify for one anyway. He says he’d consider moving for $100,000 dollars. Marathon says they looked at comparable neighborhoods both inside and outside the city of Detroit. That includes areas like Melvindale, Wyandotte and Southgate. A company spokesperson says they wanted to make sure the buyout offers would be enough for residents to buy a similar size home in another area. Many people who live in this area have owned their homes for decades. The majority of people are low-income, and many are seniors on fixed incomes. Linda Chernowas has asthma and reflux laryngitis that makes her lose her voice. She says when her doctor gave her the diagnosis… he asked her where she lived, what zip code. But she isn’t sure she wants to give up her home. Residents have complained to state officials about metallic dust that fell from the sky, coating their cars and the vegetables in their gardens. State officials have sent a violation notice for the metallic fallout to a nearby steel plant, Severstal. Rashida Tlaib is the Democratic state representative for this district. She says Marathon is moving in the right direction with their new buyout offers. But she wants to wait and see how things pan out. Residents of Oakwood Heights have until the end of February to decide whether or not to sign up for the buyout offer. Sarah Hulett contributed to this report. A little more than 50 years ago, Delores Leonard and her husband moved into their red brick ranch in Detroit. They’ve raised their two kids here and now they have four grandchildren and five great-grandkids and they all live nearby. But she says on any given day… she doesn’t know what she’ll smell when she steps outside. “There” is zip code 48217. It’s a corner of Southwest Detroit packed with heavy industry. There’s the state’s only oil refinery, owned by Marathon Petroleum. The salt mine. The city’s wastewater treatment plant. DTE’s coal-burning power plant. Severstal Steel. And many more. 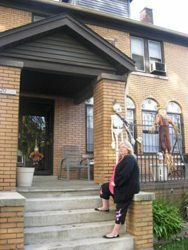 Delores Leonard grew up just a few streets over, in River Rouge. She remembers asking her dad why people were covering their cars with tarps. Like Delores Leonard, a lot of people have lived here their whole lives. So… why do these neighborhoods look like this? Ren Farley says it all dates back to the late 1800s. He’s a research scientist at the Institute for Social Research at the University of Michigan. A lot of raw materials and products were shipped on the Great Lakes, so it made sense for industries to locate in Southwest Detroit. They were built very close to factories, so people could walk to work. Farley says most of the industries in Southwest Detroit were there by the time World War I began. Some factories have shut down. Others have expanded. Farley says over the decades, federal housing policies and discriminatory lending practices called redlining were used to help white families move to the suburbs… and keep minorities out of the suburbs. He says redlining was made illegal in the 1970s, and many black families who could afford to move away from the factories did. These neighborhoods of Southwest Detroit close to heavy industry are now racially diverse, with black, white, Latino and Arab American families living near each other. Farley says it’s a mix of people who have chosen not to leave the area… and those who can’t afford to leave. But this is not a community that’s been sitting still. They’re vocal. People here call the state Department of Environmental Quality whenever they see something or smell something that seems out of place. Residents fought the expansion of the Marathon oil refinery… and lost. The refinery expansion is underway. Delores Leonard says she’s not sure things will change. But she’s also not sure she wants to leave. Marathon Petroleum recently announced a major buy-out program for residents living near its oil refinery. On Thursday we’ll hear what people in the neighborhood think about those offers. If you notice a wobble or vibration when you’re driving, it could mean you’ve lost a wheel weight. Jeff Gearhart is a researcher with the Ecology Center in Ann Arbor. He says wheel weights are about the size of your pinky finger, and there are usually one or two of them for each tire. Gearhart isn’t a traditional car guy. He cares about wheel weights because in most states, they’re made with lead. Gearhart says it’s easy to bump a curb, and lose a wheel weight. The EPA says 13% of them fall off. On the roads, the weights get crushed into dust. He says the lead winds up in the soil, in drinking water and ground water. Gearhart says there’s an easy solution – switch from lead, to weights made from steel or zinc. 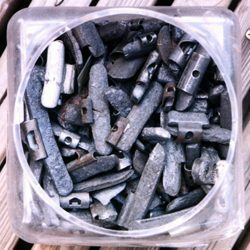 He wants the Environmental Protection Agency to issue a federal ban on the lead weights. But for now, about six states are getting the ban rolling. New York’s ban on lead wheel weights went into effect earlier this year. Robert Pike owns an auto repair shop upstate. He was taken by surprise when his tire supplier told him he wasn’t allowed to keep lead around the shop anymore. Pike says his new wheel weights are made with zinc. He and other repair shops say they’ve haven’t noticed much cost increase. But Pike says it makes more sense to ban lead wheel weights nationally, rather than state by state. Jeff Gearhart at the Ecology Center says the private sector is already moving away from lead weights. Gearhart says American companies are already manufacturing both lead and non-lead weights – but they’d like to stop making the lead weights. Matt White owns an auto repair shop, and he’s also a spokesman for the Tire Industry Association. It represents everyone from tire manufacturers, to Walmart, to independent tire dealers. Companies have to make wheel weights without lead, because there’s so much demand from other countries. White says that means they have to maintain a variety of manufacturing processes. White says his trade group is encouraging everyone in the tire industry to move toward non-lead wheel weights. But the tire industry group won’t go so far as to call for a federal ban on lead weights. A couple of years ago the U.S. EPA said it planned to write new rules on lead wheel weights, and the agency says a decision on that could come next year. Mark DuCharme is with the DEQ. He says the initial EPA-supervised cleanup focused on removing visible oil and sheen from Talmadge Creek. DuCharme says the work going on now will ensure that erosion in the creek is controlled and that there’s not a chemical problem with the groundwater or in any of the soils. He says the work that the DEQ is overseeing on Talmadge Creek should be wrapped up by March. Enbridge delivered a revised cleanup plan to the EPA last month. 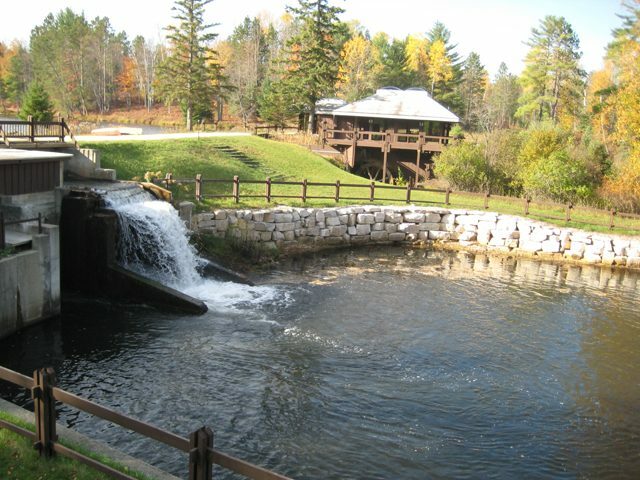 It outlines the company’s plans for removing submerged oil from the Kalamazoo River into 2012. Mark DuCharme with the state DEQ says there is a possibility that more work will need to be done after that…. The DEQ is working with Enbridge and the EPA to identify areas where a second round of cleanup may be needed. Enbridge estimates that the cost of the total cleanup will be in the range of 700 million dollars. 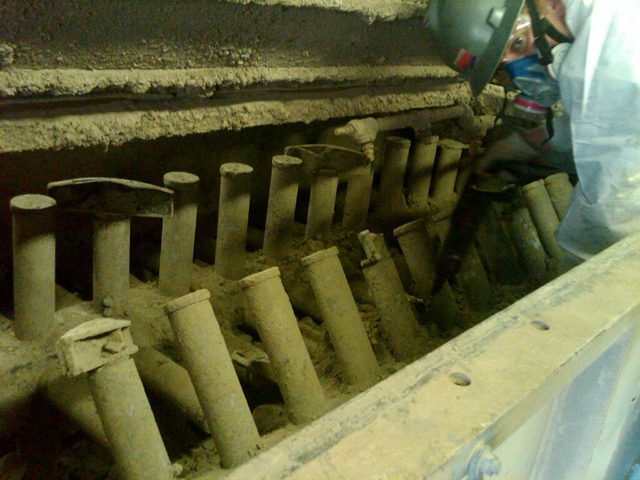 For the past few days… Dennis Brabant and his crew have been vacuuming up tons of fly ash trapped in the silo at the Lansing Board of Water and Light ‘s Eckert Power Plant. Brabant lets the fine power pour through his fingers. It spreads like water on the silo floor… and coats everything. 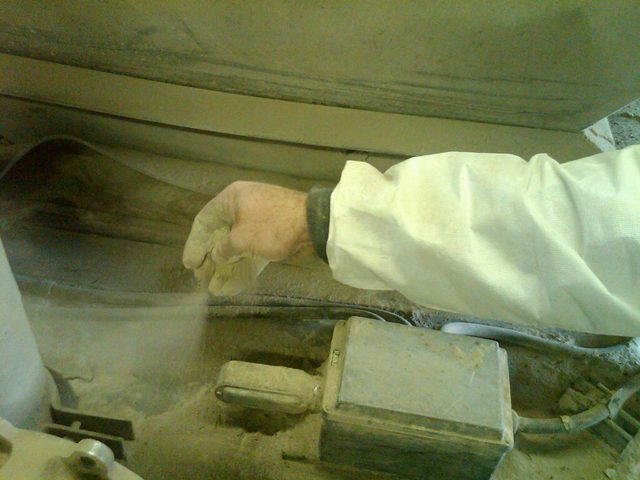 Fly ash contains trace amounts of mercury, arsenic, lead and other toxic chemicals. Deborah Allen is the plant manager. She says BWL does everything it can to contain the fly ash in its silo…and keep it from escaping…and blanketing the surrounding neighborhoods in a fine dust. But fly ash is not just by-product of burning coal…it’s also a commodity. As recently as 2006…Lansing Board of Water and Light earned a million dollars from selling ash collected from its coal burning power plants to companies that make concrete and asphalt. What wasn’t sold was landfilled. But as the recession slowed the economy… it also slowed demand for fly ash. Meanwhile… there could be changes coming that could affect how BWL and other Michigan utilities dispose of their fly ash. The public comment period on the proposed new regulation ends next week. A Lansing Board of Water and Light official says BWL will “do whatever is necessary to comply with any existing or future regulation from the EPA.” That same official declined to speculate on what those changes may eventually be. For the Environment Report, I’m Steve Carmody. Michigan’s only oil refinery is offering to buy out homeowners near its Detroit facility as it wraps up a major expansion project. Marathon Petroleum is upgrading its refinery in southwest Detroit to be able to process heavier crude oil from Canada. And it’s expanding its operations closer to a neighborhood called Oakwood Heights. Tracy Case is Marathon’s Michigan refining division manager. He says residents in Oakwood Heights face a unique challenge. The company is offering a minimum of $40,000 dollars, plus half a house’s appraised value. There’s also money to help people with moving expenses, and some other bonuses. For some homeowners, it will be a sweet deal. But Carrie Elliott says he’ll pass. Homeowners have until the end of February to request an appraisal, and offers will be made over a two-year period. Earlier this week, there was a landslide at a coal-burning power plant in Wisconsin. We Energies operates the plant. On their property, there’s a ravine next to a bluff on the shore of Lake Michigan. That ravine is filled with coal ash. Coal ash is what’s left over when coal is burned to create electricity. Coal ash can contain toxic substances like arsenic, mercury and lead. When the bluff collapsed on Monday, mud, soil, and coal ash spilled into Lake Michigan. Barry McNulty is with We Energies. McNulty says they don’t know how much coal ash got into the lake. He says they are installing booms and using skimmers to clean up the spill. The cause of the spill is under investigation. Coal ash is not currently listed as a hazardous waste by the Environmental Protection Agency. It is regulated… but it’s regulated in different ways by different states. The EPA has proposed tighter regulations on coal ash. The regulations could require liners on coal ash storage sites and groundwater monitoring. Tiffany Hartung is with the Sierra Club’s Beyond Coal Campaign. Hartung says there are nine active coal-ash storage sites in Michigan… and another seven that are closed. She says the Sierra Club is concerned about efforts in Congress that are attempting to stop the EPA from categorizing coal ash as a hazardous waste. There are two proposals from the EPA. One would regulate coal ash as a hazardous waste and the other would regulate it like household waste. The Senate is expected to take up the debate any day now. Governor Rick Snyder met with lawmakers, federal officials and the railroad industry yesterday to talk about the future of rail transportation in our state. Rick Pluta is the State Capitol Bureau Chief for the Michigan Public Radio Network. He was at the Michigan Rail Summit and he joins me to talk more about this. So Rick, what did the Governor say? Pluta: For him, this is a critical part of his plans for the state’s economic revitalization. And we should say this isn’t going to be like the 220 mile per hour bullet trains that they have in Europe and Asia, but faster trains that will go for about 110 miles an hour. And he envisions Michigan being part of this business corridor that runs from the western edge of the Midwest in St. Louis all the way up to Toronto, Montreal, the new port that is being built in Halifax. 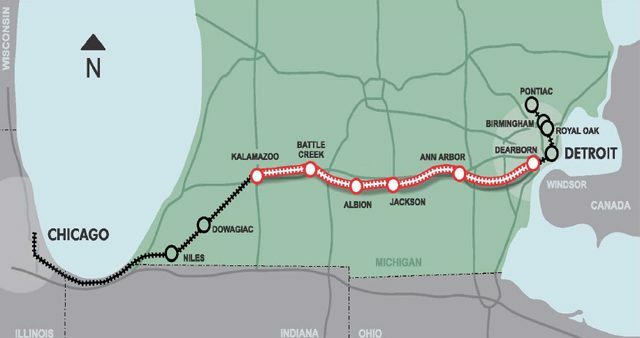 And Michigan is sort of a central point in that corridor, and that could make Michigan a key player in a Midwestern-Canadian economy. Rebecca: You know, I’ve taken a lot of train trips to Chicago that were supposed to take six hours and took a lot longer than six hours. What’s going on there and what are people doing to fix those problems? Rick Pluta: What we’ve got right now is a system of freight vs. passengers. And because almost all the track is owned by freight companies, part of the agreement is that when a freight train is coming and an Amtrak train is en route, the passenger train has to stop. What state officials are hoping is they can come up with something, you know, better coordination of routes and scheduling of freight trains and passenger trains… more turnouts, where when there are two trains that are sharing the same piece of track, that there’s someplace else for them to go… basically you’re not going to have the same level of competition for the same track between freight and passenger service, and if there is competition, then it’s not always going to be the passenger train that’s going to have to stop and wait. Rebecca: So Rick, is anybody talking about establishing passenger rail lines between someplace in northern Michigan and southern Michigan? Rick Pluta: Yeah, there’s always some talk and it’s somewhat whimsical, you know, recreating the tourist trains that were popular in another era. And most of the people I talked to here said that’s probably a long way off. But there is a lot of focus though, on improving the freight service from northern Michigan, because there’s a lot of manufacturing in northern Michigan, there’s a lot of agriculture and agricultural processing in northern Michigan. And so the challenge is, how can you take the track, especially the hundreds of miles of state-owned track, and improve that, so that trains can get eggs from Kalkaska very quickly to markets maybe in St. Louis or somewhere in northern Canada or even to the new port that’s being built in Halifax and get it over to potential markets in Europe and Asia more quickly than they’re getting there right now. Rebecca: All right, thank you Rick. Rick Pluta: My pleasure, Rebecca. Rick Pluta is the State Capitol Bureau Chief for the Michigan Public Radio Network. That’s the Environment Report for today. I’m Rebecca Williams.